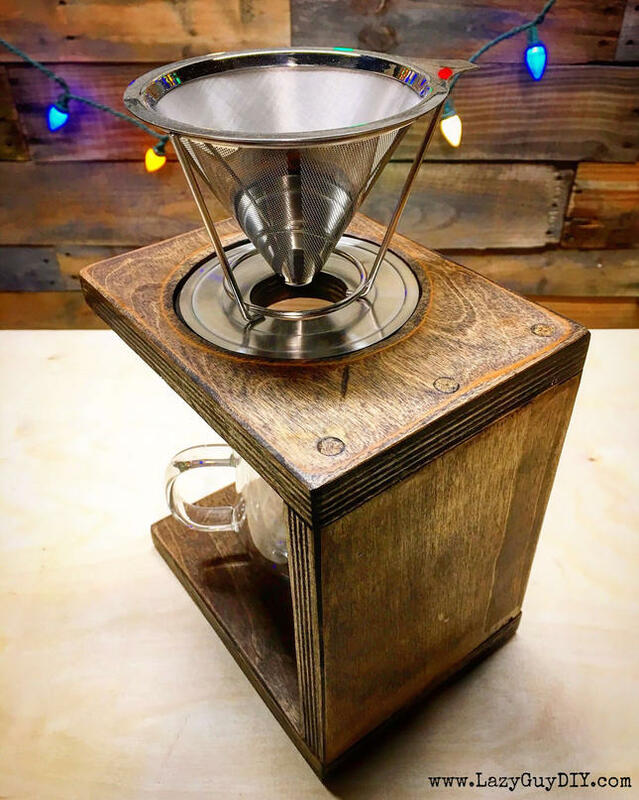 Pour over coffee makers are all the rage right now. 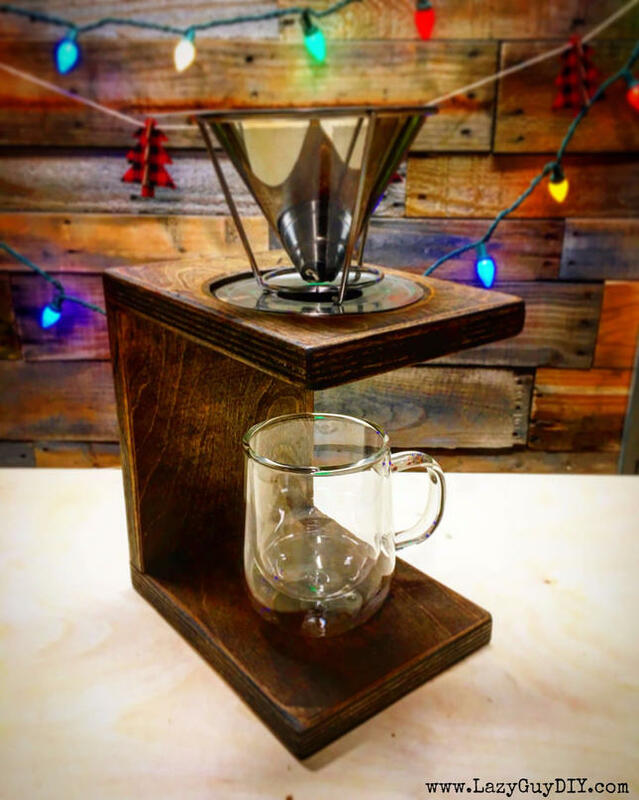 Thanks to Chemex Coffee Makers, pour over style coffee is back in the lime light and for good reason, it makes one of the best tasting and simplistic cups of Joe you’ll ever have. The concept is simple. Take fresh coffee grounds, put it into a filter and then pour hot water over top and let it filter into your cup. That’s it. That’s what your Keurig does, but this also doesn’t have little nooks and crannies for stagnant water and bacteria to grow science experiments. Throw in the fact that this little number is handmade and good looking to boot and you have one heck of a winning combination. On to the build! Staying in line with “minimalist” this might be the least amount of material I’ve ever used in a project. 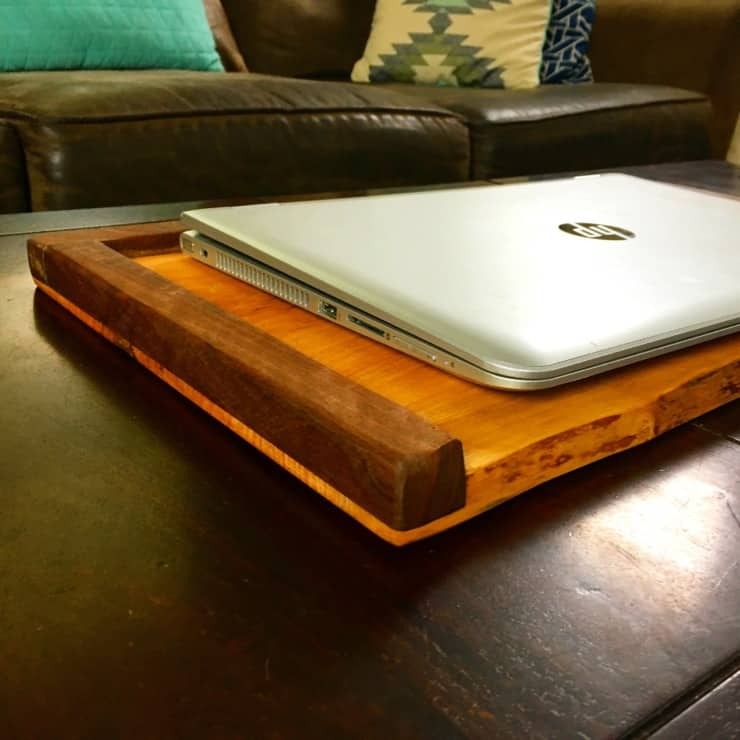 I used 3/4″ sanded plywood for this project. Mainly because I really like how plywood looks when you start sanding or cutting through layers. The different types of material make for an interesting look when you start staining. You can absolutely use a 1×6″ board for this project instead, but I felt like the sanded plywood really added an extra element. An extra piece of flair if you will if you worked at Chotchkie’s, Brian might have 37 pieces of flair, I’m only adding one. 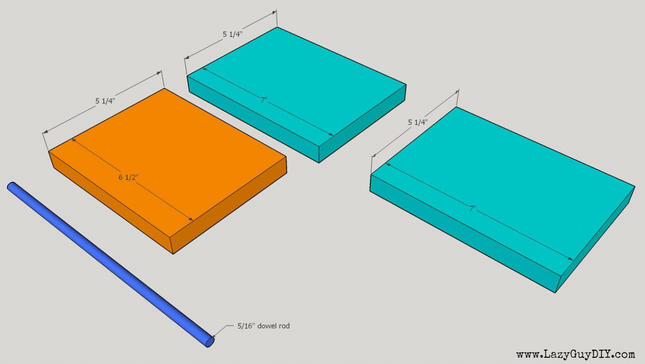 Cut your three pieces, two for the bases at 5.25″ x 7.00″ and one for the support at 5.25″ x 6.00″. What’s going to be obvious here is that if you purchased an entire quarter sheet of plywood and you’re going to have a ton left over, but that means you get to make a bunch of these! Hooray! Ha. I honestly had scrap plywood sitting around from another project that I used on mine. Make the stressful decision as to which piece will be your top. Mark off 3/4″ from what will be the end and draw a guideline across the 5.25″. Measure from the front to the guide line and mark what will be the middle at around 3.125″. Center your Coffee Dripper on that mark and trace the outline for the area that will need to be cut out. This is pretty much the only “quasi” advanced step in this entire build. Plus it’s completely optional. Using my compact router, I inserted a straight cutting bit (size of your bit doesn’t matter in this case but ask your spouse for reassurance) and set the depth of my plunge base between 1/8-1/16th of an inch. You don’t have to be precise. 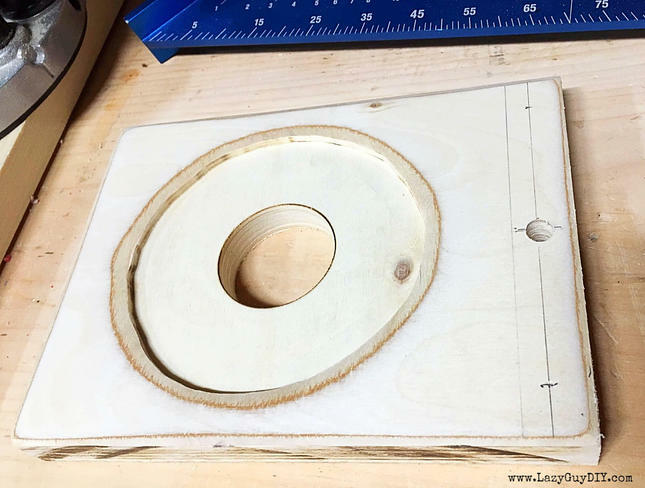 Then I free handed with the router around the circle I traced from the Coffee Dripper and cut out any material within this circle of trust. Let’s get this out of the way early… it’s not going to be perfect. You’re free handing. 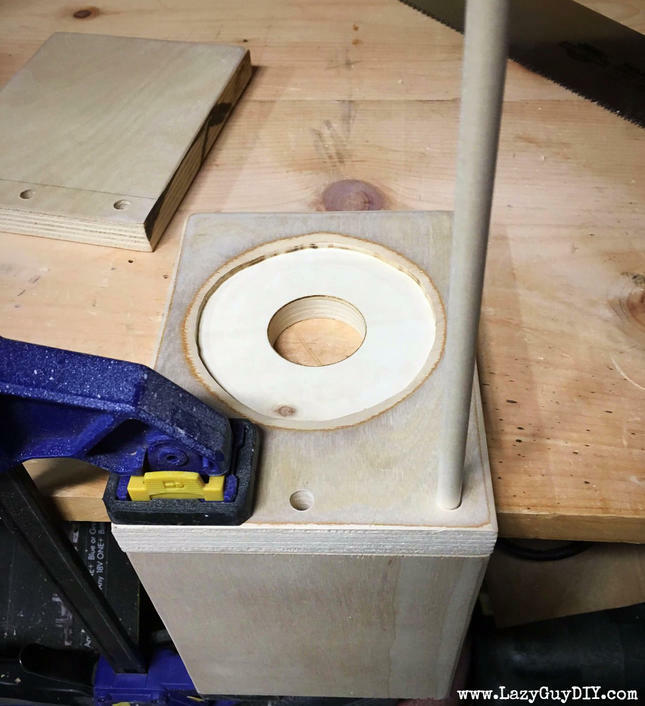 There are router jigs that let you make perfect circles. That was more time and effort than I was willing to expend on this. 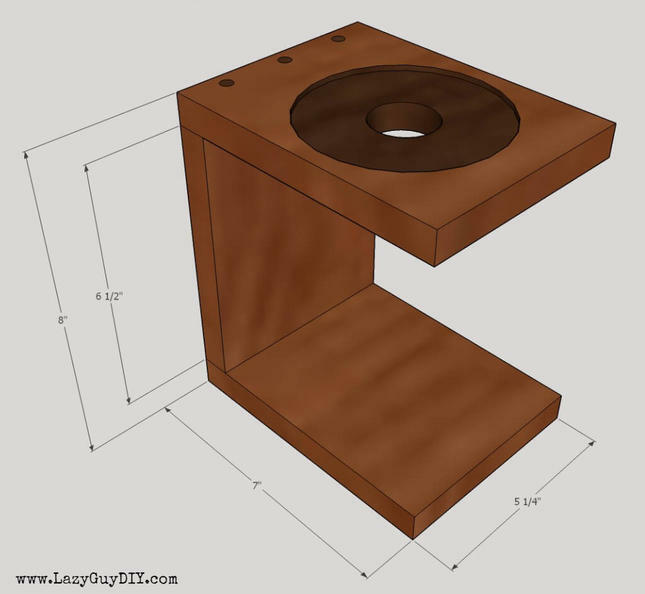 You’re going to need to dry fit a few times with the coffee dripper until you get a good fit. It’s okay if you make it a little too big, what’s important is that it sits flat. 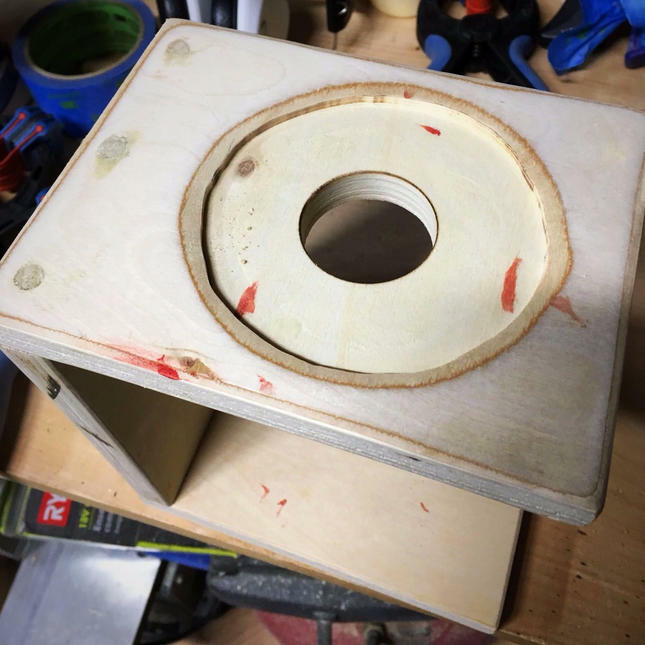 Ignore the hole I cut in the middle for this step… I then sanded all of the edges of THE TOP ONLY of this piece. Don’t sand the bottom edges yet because you need flush edges for assembly. 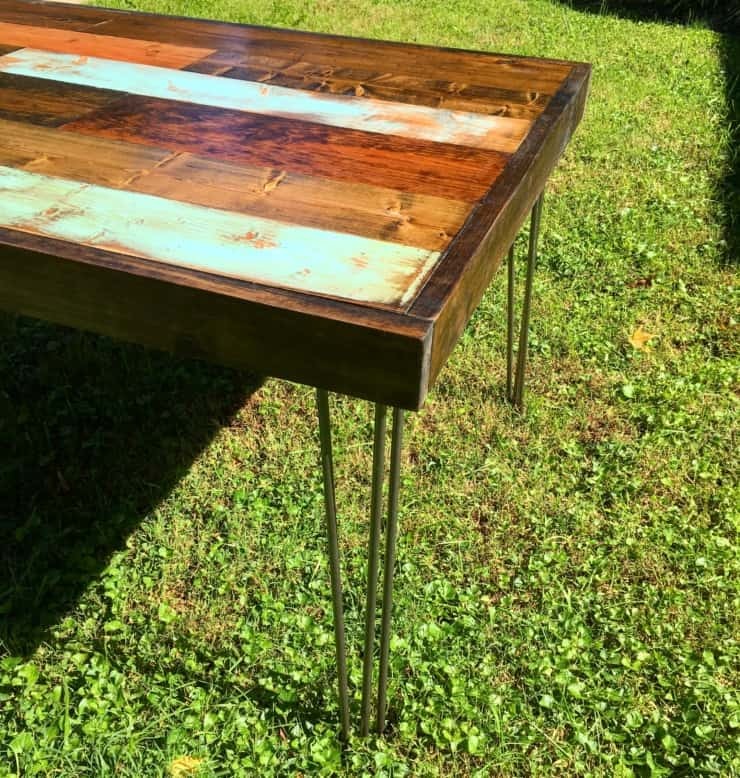 Keep in mind anything you sand off will stain a slightly different color. If you accidentally sanded off your 0.75″ guide line like I did, draw it back on and then also draw a line at 0.375″ right down the middle. This will help you mark off your pilot holes for your dowel rods that are going to be used to join the materials. 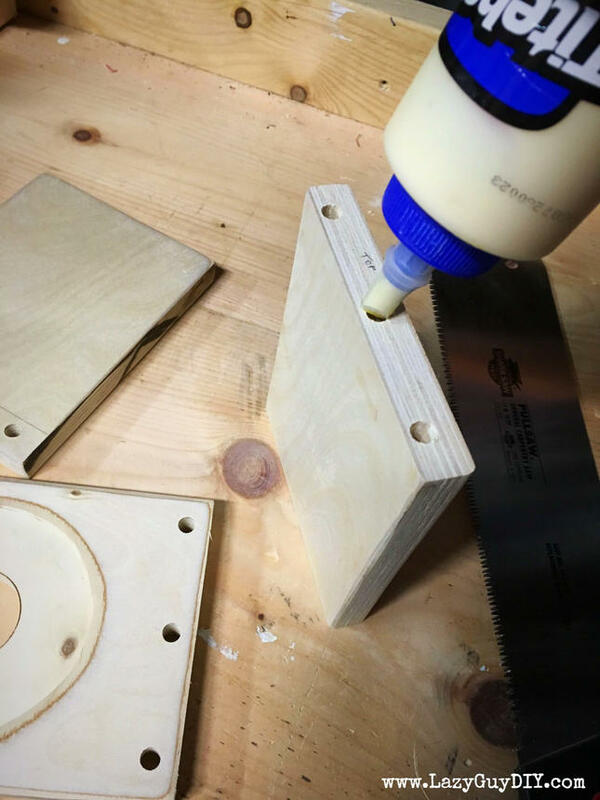 I used a 5/16″ drill bit and drilled 3 pilot holes. 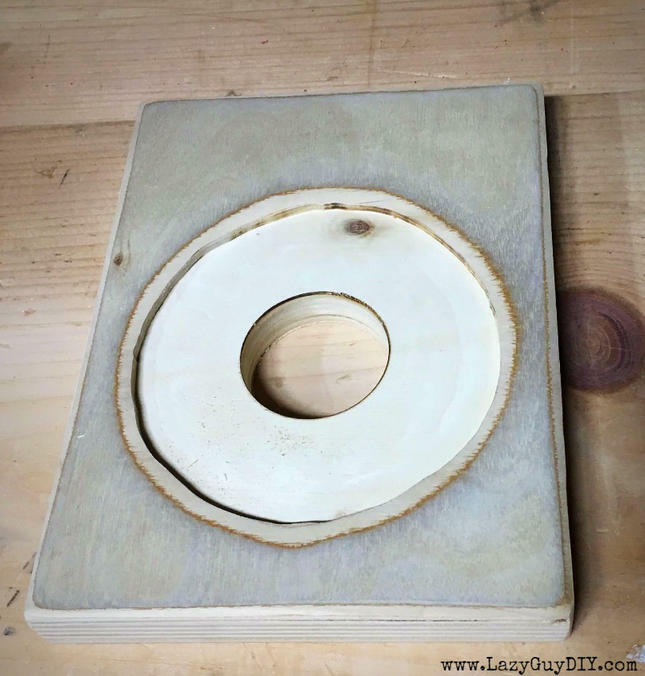 You’re going to be drilling down into a piece of material that’s only 3/4″ wide for the support in the next step, so you want to make sure your holes are on center and straight. Once again, drill from the top down to the bottom. 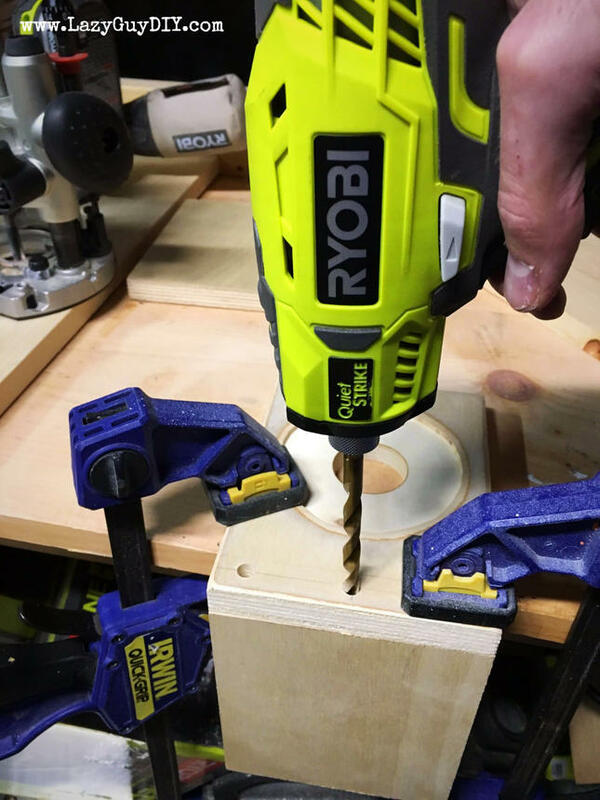 Do the same with your 5.25″ x 7.00″ base, but drill from the bottom through the top. If you have any blow out, it will be hidden by the support piece. 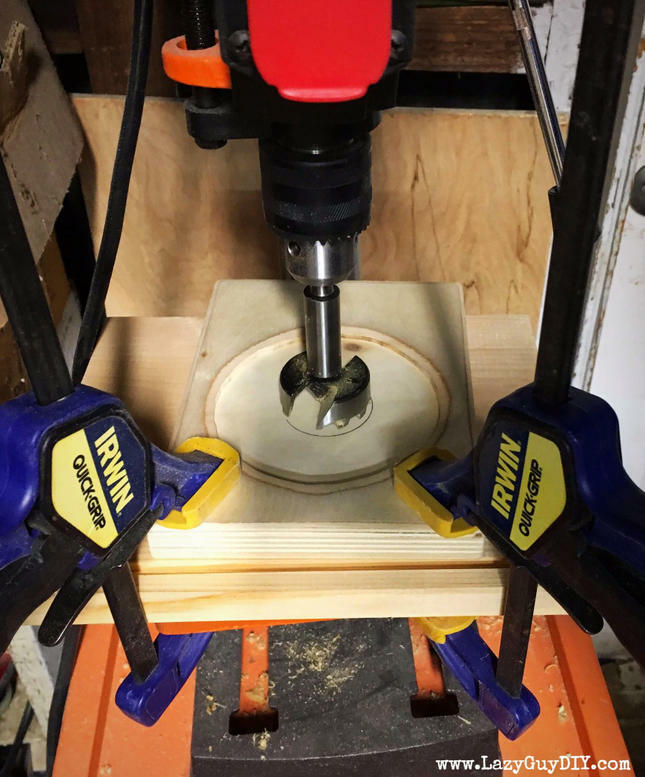 Using a pair of speed clamps, I lined up the 5.25′ x 7.00″ top panel and the 5.25″ x 6.50″ support panel and drilled down with the 5/16″ drill bit. You want to make sure you drill into the support panel about 1″, that does not include the depth from the top panel. With the holes pre-drilled for the top, I did the same for the bottom panel. PRO-TIP: After drilling from the top into the support panel, mark which end is the top and which direction it needs to face when it’s attached. Your pilot holes are not going to line up perfectly if you have the panel turned the wrong direction or is upside down at assembly time. Put a few dabs of wood glue into your pilot holes and then along the edge you’re going to assemble first. I use a glue applicator from Rockler to help spread the glue out on the edge. Remember if you have any excess glue that seeps out of the edges and dries, the stain won’t take on it and the edges aren’t easy to sand. With the glue applied, line up your pilot holes once again and use a pair of speed clamps to secure the top and middle pieces. Add an additional dab of glue into each pilot hole and then insert the dowel rod. I’m going to tread lightly here… this is a minefield of innuendo I’m going to do my best to navigate… Make sure the dowel rod goes all the way into the pilot hole and sits flush with the bottom. Then cut off the excess with your handsaw. I’m going to take a moment and issue a PSA that handsaws are just as sharp and dangerous as power saws. As I was cutting through the final threads of the first dowel, the saw blade came through and cut my thumb that was brilliantly in the path of the saw blade. Long story short, saws are sharp. Rather than subject you to multiple bloody project photos, I’ll give you just one below with the caveat that I did have to sand the blood out. No one makes me bleed my own blood… but myself apparently. Once you’ve cut the tops off of all 3 dowels, go back and put a few drops of wood glue over each dowel head and then use some of the sawdust from your sander and smear it all together. Rub it in good and wipe off the excess. 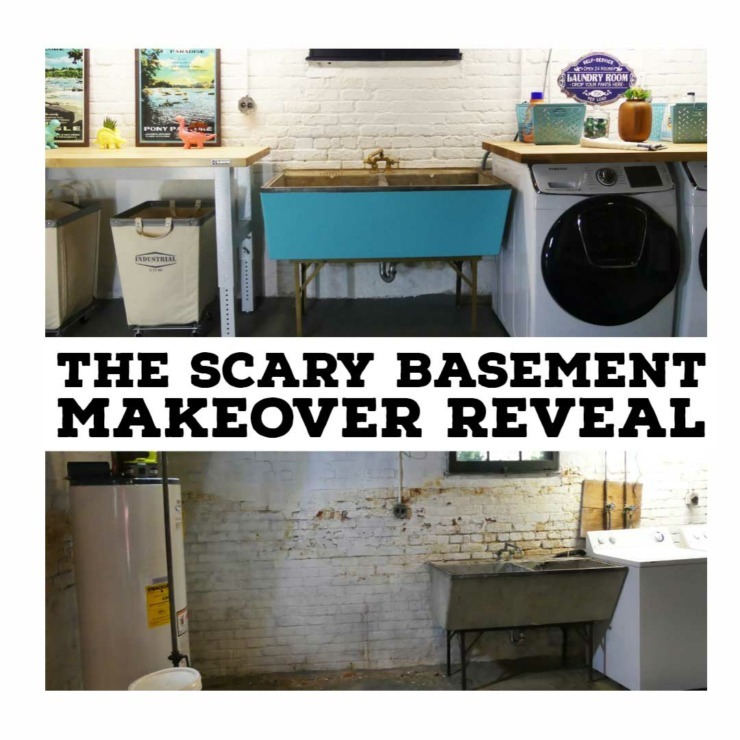 It’s going to look terrible at first, but guess what? You just made wood filler! 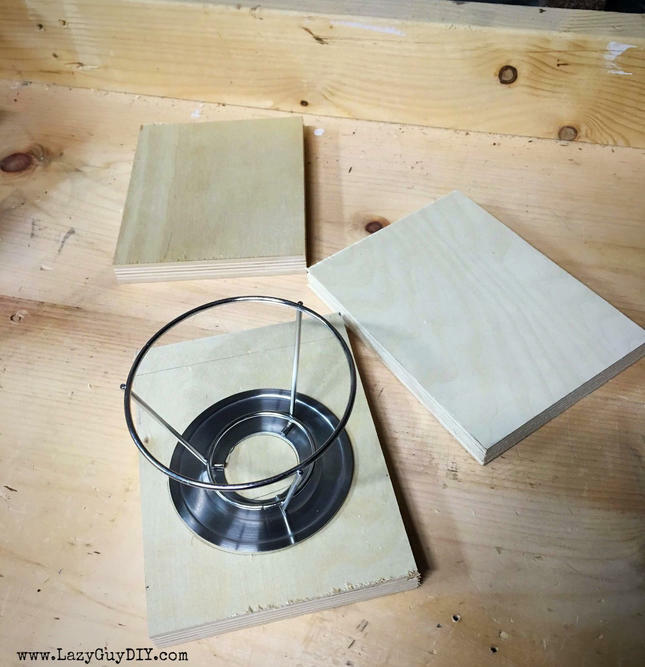 Insert and cut off your dowels on the bottom as well and use the same wood filler trick. Then, let the whole thing sit for a few hours. If your top and bottom panels look a little saggy or wonky you can clamp them during the drying time into a straighter position. Once it dries, you won’t be able to go back and fix this. 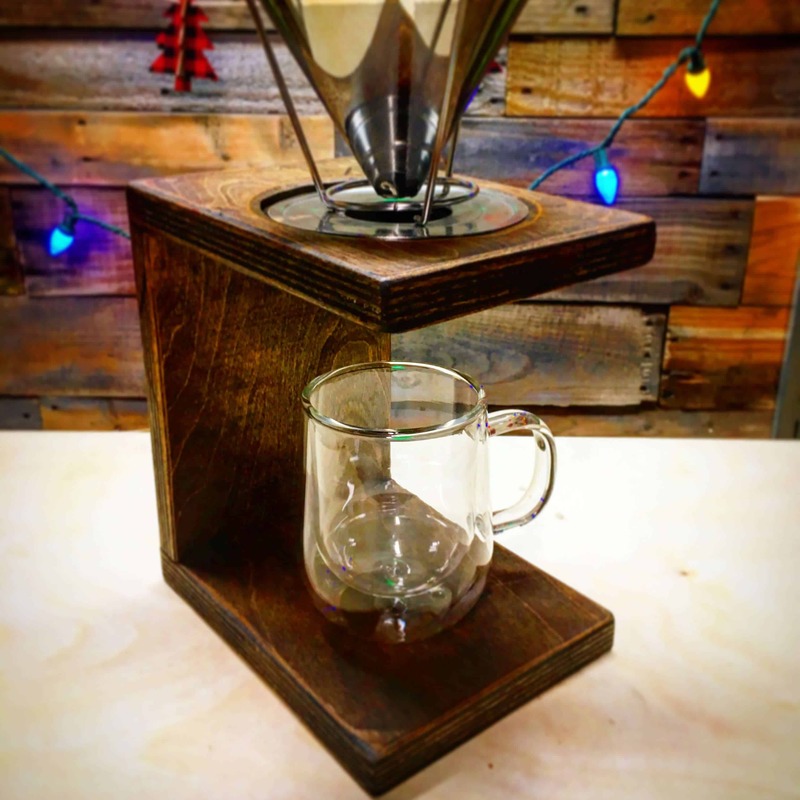 So make it perfect or live with your failures… in the high stakes game of coffee maker, um, making. 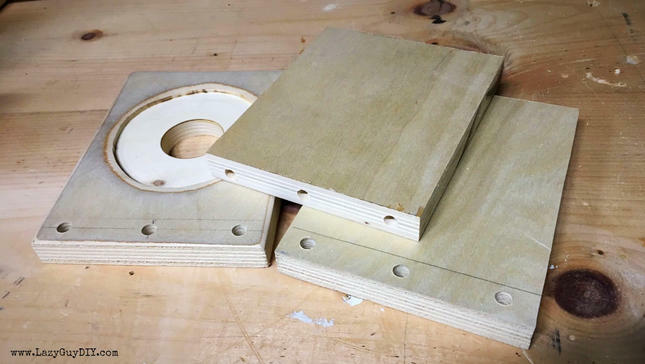 Once you’ve waited for the glue to dry, you can go back with your sander and grind off any excess wood filler and dowel rod 100-150 grit sandpaper. Once you get the roughest patches off, switch over to a 220 grit sandpaper and finish the rest of the piece. You’ll remember we didn’t round the edges prior because you wanted flush edges for assembly. You can now sand any and all surfaces so they are smooth to the touch. For my coffee maker I used my current favorite tone MinWax Espresso Stain. Once it dried I applied three coats of MinWax Semi-Gloss Poly. I hand sanded with 300+ grit sandpaper after the second coat and then applied my 3rd and final coat. And that’s it. I boxed it up and sent it out for my Secret Santa Present never to be seen again. This is a great little project that let’s you use a couple of techniques that you might not normally use for bigger projects, so give it a go, it’s a great gift that you can knock out in a couple hours. As always, if you have any questions, feel free to reach out to me and of course, share me photos of your builds!